Body condition influences everything in your horse’s life, from reproductive efficiency, to performance, to good health. 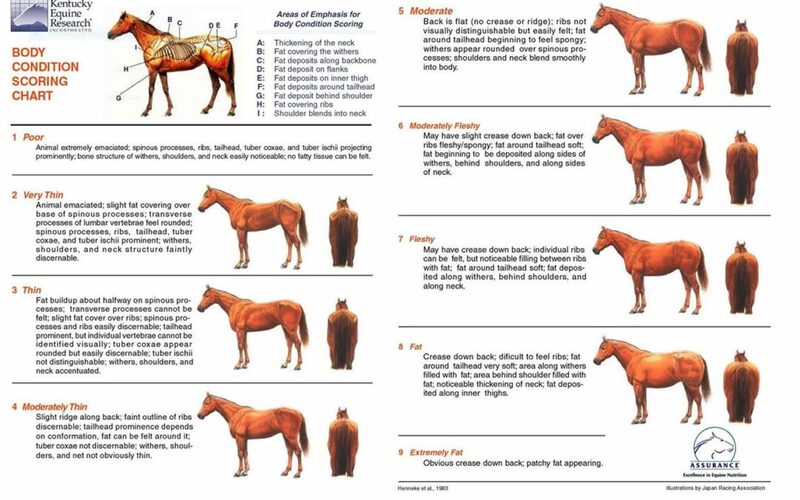 By using Body Condition Scoring, you can find out what kind of shape your horse is in, and work to improve the score. Scoring focuses on critical areas of the body, based on palpable fat and visual appearance. Most horses, including performance horses and growing horses, should be in a body score of 5-6. For optimum reproductive efficiency, broodmares should be a 5-7, and not allowed to lose condition such that they are below a 5 during breeding season. Horses over a condition score of 7 may be at a greater risk for developing metabolic disorders such as insulin resistance. For a larger version of the above image, click here.